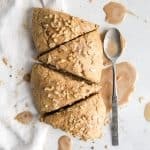 Vegan Banana Scones made healthy using whole grain flour, coconut oil and lightly sweetened. No eggs needed in this recipe. The perfect weekend baking activity. In a large bowl or bowl of food processor add flour, sugar, baking powder, salt, & spices. Stir or pulse until combined. Add frozen coconut oil or butter: Grate frozen butter or coconut oil chunk into bowl of dry ingredients then work in with pastry blender. If using food processor, cut in frozen coconut oil or butter by pulsing until small chunks remain. Gently stir in the banana, milk and vanilla to large bowl of dry ingredients, careful not to over-work the dough. Or with food processor motor running, add in milk until just combined. Then remove S-blade and continue stirring with spatula. The dough should be thick and slightly sticky. Sprinkle flour on flat surface and using floured hands shape dough into large circle, about 8″ in diameter, on prepared baking sheet. Using a large sharp knife cut 8 triangle slices into dough. Gently pull apart and place 2″ apart on baking sheet. See notes in post for other baking options. Bake for 15-20 minutes, until edges are crisp but middles are still slightly soft. Let scones cool on baking sheet for 5 minutes before transferring to wire rack to cool completely. Glaze once scones have cooled. Scones will stay fresh in airtight container, best enjoyed the day of but within 3 days. *half unbleached all-purpose, half whole wheat flour may be subbed. If using ALL whole wheat flour, your scones will probably be more dense and possibly dry. I would add a few tablespoons LESS of flour if you go this route. 1:1 gluten-free baking flour should also work. Feel free to use frozen dairy free butter or conventional butter here if not vegan. But it’s best to use frozen. You can also double wrap scones with plastic wrap and store in freezer up to 1 month. Thaw at room temperature or in microwave.